Ayer, Sábado, fue el concierto de Regina Spektor. En mi mente, tenía pensado ponerme este outfit (foto): camisa de encaje (H&M), jeans (Zara), creepers y mochilita de cuero (H&M) pero el clima no estuvo mucho a mi favor. Terminaron haciendo unos 15ºC y lamentablemente tuve que hacer unos cambios drásticos en el outfit, pasándome a zapatillas, un sweater y campera de cuero. Yesterday, Saturday, was Regina's Spektor concert. 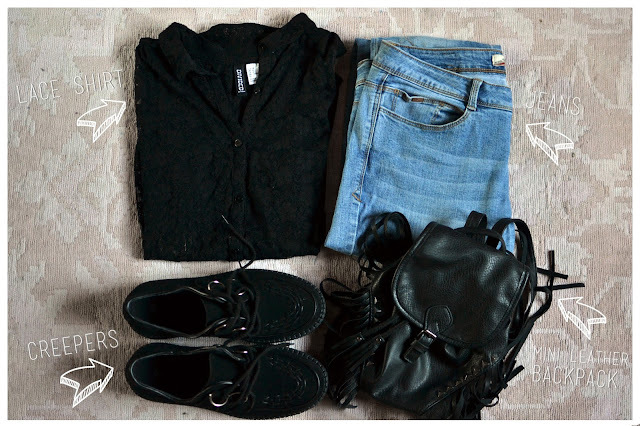 In my mind, I had planned to wear this outfit (picture above): lace shirt (H&M), jeans (Zara), creepers and a mini leather backpack (H&M) but the weather wasn't much on my side. Being only 15ºC outside and I had to, unfortunately, make a few drastic changes on my outfit turning to sneakers, a sweaters and a leather jacket.